One of the first questions that new owners of AR-15A2s ask gun geeks like myself is just how in the heck the military decided to settle on rifling with a 1-in-7" twist rate, since it has been reported to cause premature barrel burnout. Well, the answer is the L110 tracer round (American designation M856), which was adopted at about the same time as the European SS109s, American M855, and Canadian C77 steel-core rounds. This projectile required the special attention because it's very long for a .223 -- 1-3/32" by my Starrett. It stands 1/32" taller than the Sierra 80-grain bullet that was the impetus behind the 1-in-8" twist barrels now in favor with match shooters faced with the slow-fire 600-yard stage of the NRA DCM Service Rifle course. As shown above, a major difference between the last two is that the Sierra bullet is sufficiently streamlined up front as to require seating the bullet so far out that the cartridges will not fit into the magazine as there is not enough surface area to grip prior to that point, and thus they must be loaded individually into the chamber. 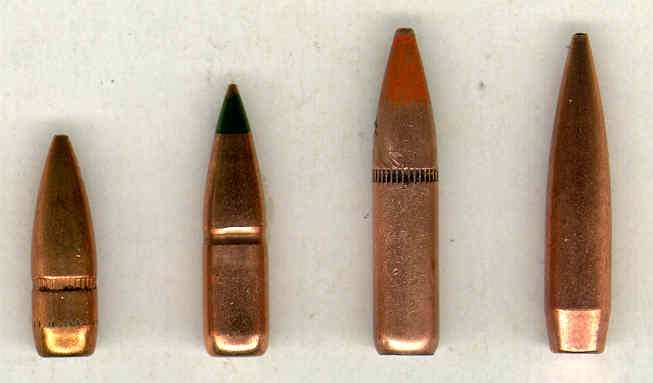 The front portion of the L110/M856, on the other hand, closely follows the profile of the standard ball bullet, with the cannelure (the notched or grooved area into which the mouth of the cartridge case is crimped) appearing approximately the same distance from the top of the projectile as the standard ball rounds, which means that the bulk of the actual tracer section is contained within the hull. The L110/M856 was designed to deliver an 800-meter visible burn, an incredible requirement considering the initial mass of the bullet (one I pulled weighed in at 60.6 grains). Given our current state of the art in chemistry, this calls for a large percentage of the original package's weight to be tossed overboard during transit. Physics then obviously demands an increasing level of deviance in the projectile's path from the 62-grain ball rounds that it was intended to emulate. As I have never read an article that actually documented the degree of variance, I decided to test it myself. I unfortunately did not have a M249 SAW (Squad Automatic Weapon) on hand to test the bullet's intended performance out to 800 yards, so I selected my sole 1-in-7" twist AR-15 upper, a 16" lightweight-barrel Colt, and placed it on my Eagle match lower, which has a crisp 4.6-lb trigger. In order to lessen the effects of simple sighting errors from the equation, I stuck a 3X9X40mm Nikon scope onto the carrying handle via an ARMS mount and Burris steel Zee rings. I managed to stumble across twenty rounds of '86 Lake City M856 at a Fayetteville gun show a few years back, and used these for the test. They had an orange tip on the bullet, a ring-crimped primer, and were headstamped with the NATO cross-in-circle emblem followed by LC and 86 at 7 and 5 o'clock respectively. I have more tracers on hand, but they came from different case lots, dug out from the cheap, mixed (nominally Israeli) piles of dirty, stomped-on, and often de-linked .223 ammo that appeared in the wake of Desert Storm. The SS109 ammunition I chose for comparison was Austrian Hirtenberger with green lacquer on the triple-staked primer and bullet tip. This particular round is headstamped 83 / 5.56 / .223 at the twelve, four, and eight o'clock positions. The case I purchased has proven astoundingly accurate (the first ten shots out of my super-heavy-barrel Eagle AR went into 2.65" at 200 yards), and its cousins are still available on the commercial market. I paid 20 cents a round at a Raleigh show, a truly schweeet deal these days. 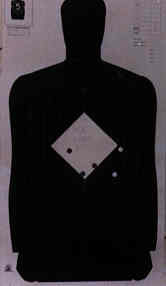 I began each series at the selected distances of 200 and 300 yards by sighting-in the rifle. It rested on a sandbag that touched the front of the magazine well, to reduce the upward pressure on the barrel. Firing the Hirtenberger ammunition until an acceptable zero was acquired on the left-hand member of the pair of targets placed at each marker, I then pasted the resulting holes and fired an "official" five-round SS109 group. After permitting the the barrel to cool down for ten minutes, I then switched to the M856 for a five-round group on the right-hand target. After recording the results, I then pasted both targets and began the second relay at each distance. 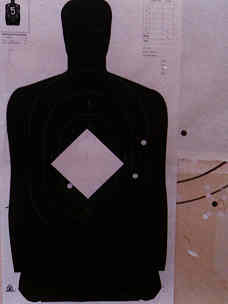 To ensure that the scope did not shift under recoil, I fired a final five-round group on a clean target with ball at both ranges. Ball Target One - 4-5/8"
Ball Target Two (second relay) - 5-1/16"
Tracer Target Two - 9-1/2"
Final Ball Target at 200 yards - 5-1/2"
Ball Target One - 7-3/8"
Ball Target Two (second relay) - 10-1/16"
Final Ball Target at 300 yards - 8-9/16"
Shown below are pictures taken during the first series fired at each distance (I set out with only six snaps left in my 110 Instamatic, so sue me). Reverse-color pasters were used to make the hits more obvious. As the photos show, the raw group-size information is a bit misleading. The M856's shot noticeably to the right at both ranges (approximately 4 inches at 200 yards and 6-10 inches at 300 yards), in addition to being about 7.5 inches high at 200 yards. I don't have a chronograph, and thus speculate -- admittedly perhaps wrongly -- that what occurred is due to the much-greater bearing surface (as illustrated in Figure 1, the amount of surface area that actually comes in contact with the rifling) of the M856 combining with the lessened case powder capacity to reduce the initial velocity sufficiently to permit the operator to rotate a bit and move the barrel slightly upward under recoil. The fact that the rounds dropped back down to an acceptable elevation at 300 yards bodes ill for anyone hoping to hit anything other than dirt at greater distances, as diminishing weight and an inefficient projectile profile that is not very wind-resistant team up to further slow the bullet, allowing gravity (which thus has a longer period of time to work on the tracer vs. the ball round for the same amount of distance traveled) to do its thing. So what are the implications of my results? Well, if I was a militia type, I'd rag on the round for its dubious fire-control capabilities at ranges past 300 yards. But I'm not, and the only use I have for tracers is to stick two or three at the bottom of each magazine in order to alert myself when I'm about to run dry (as suggested by Peter Kokalis). Since the L110/M856 is an iffy proposition at even 200 yards, I'd be happy to switch to the older and cheaper American M196 tracer, but here's a final bit of nastiness: the tracing compound used in these projectiles appears to have a much shorter shelf-life than the cartridge as a whole, yielding reliable ignition for maybe fifteen years or so. I recently picked up a pristine twenty-eight year old box of Twin Cities M196 at a show for five bucks, and experienced a 70% failure rate, with the "successes" igniting at wildly varying distances. Criminy! Anyone know if Hornady plans to expand its "Vector" line to rifle calibers?